It's my great pleasure to welcome a former student, Jihan A. Kahssay (left), as an IntLawGrrls contributor. Jihan is a student at the University of California, Davis, School of Law, from which she expects to receive her J.D. degree at the end of this year. Jihan focuses her studies on international human rights and refugee law, and has just been honored as the 2012 recipient of the Pritikin Award for best student article submitted to the UC Davis Journal of International Law & Policy. Her paper, "Lessons Learned from Somalia: Returning to a Humanitarian-Based Humanitarian Intervention," will appear in a forthcoming edition of the journal. Her family is originally from Eritrea, although she grew up in Saudi Arabia and Canada. For several months last year, Jihan worked in partnership with the U.N. High Commissioner for Refugees field office Addis Ababa, Ethiopia, assisting Eritrean and other refugees seeking resettlement. Jihan discusses lessons learned from that experience in her introductory post below. She went to Ethiopia as a University of California-Davis Human Rights Fellow -- one of 2 last summer; the other was Joanna Cuevas Ingram, who also has contributed an IntLawGrrls post. In the summer after her 1st year of law school, Jihan worked for Legal Services of Northern California, as a King Hall Legal Foundation Fellow and Hogan Award Recipient. This summer, she will work as a research assistant for California-Davis Professor Leticia Saucedo. Empress Zewditu held the title of "The Queen of Kings," and was the first woman head of an internationally recognized state in Africa. 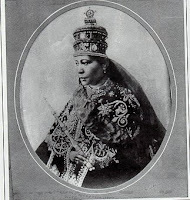 Under her rule, Ethiopia entered the League of Nations and abolished slavery. Today Zewditu joins other inspiring women in on IntLawGrrls' transnational foremothers page.